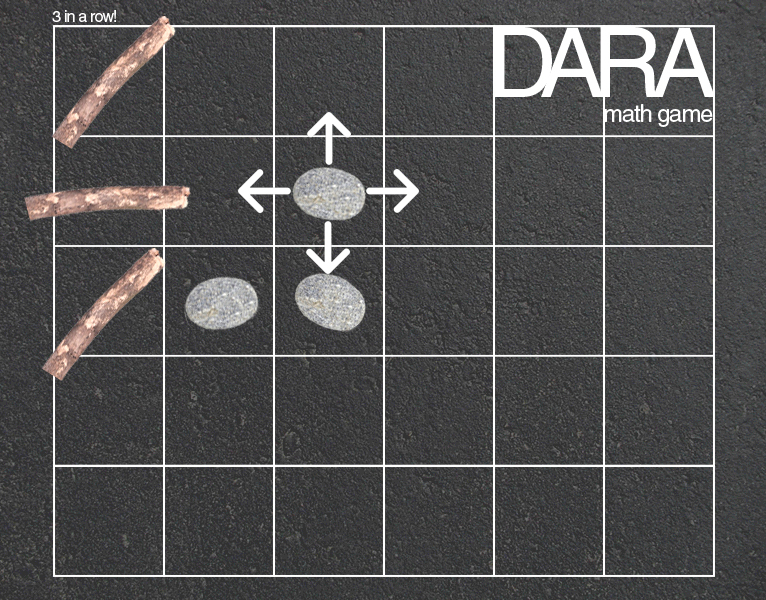 Nigerian problem solving game from the Cincinnati Art Museum : Dara! It can be played on the pavement or on paper! First, create a 5 x 6 grid. Next, create teams of two. Each team gets 12 counters (sticks vs. stones or other manipulatives). Teams take turns laying down a counter on a square (anywhere - see note below). Once all counters are laid, the game begins. Teams take turns moving their object to an adjacent open square. Moves can only be up, down, left, or right. The goal is to get three counters in a row. If they get three in a row, they remove one of their opponent's counters. The game is over when a team cannot make any more moves. The team out of moves loses! 1. Teams must scatter their objects around the board, when placing them before the start of the game. They are only permitted 3 objects in a row before the game. 2. Counters placed 3 in a row before the game begins don't count. They must make a move to remove an opponent's counter. 3. Teams can only remove one of their opponent's counters, even if their move could knock out more than one. Click here for more math games from Nigeria, Zimbabwe, and Mozambique!